Twenty years ago, Jane Austen was an in-demand scribe indeed. The six-hour BBC adaptation of Pride and Prejudice starring Jennifer Ehle and Colin Firth as Elizabeth Bennet and Fitzwilliam Darcy, premiered in Britain to great acclaim and would shortly have an equally swoony effect on America when it aired here in January 1996. In the midst of all the P&P revelry, another Austen adaptation arrived on movie screens – and the conquest was complete. Across a five-year period, producer Lindsay Doran had coaxed Howards End Academy Award®-winning Best Actress Emma Thompson to write a screen adaptation of Sense and Sensibility (1995), and once completed, Columbia Pictures production executive Amy Pascal agreed to back it. Thompson was initially not supposed to star, but was fortunately persuaded to play the reserved Elinor Dashwood. Kate Winslet, who had just made her movie debut in Peter Jackson’s Heavenly Creatures, nailed the role of her more impetuous younger sister, Marianne Dashwood. One casting felicity after another followed: Hugh Grant, Alan Rickman, Robert Hardy, Harriet Walter, Imelda Staunton, Hugh Laurie, Greg Wise, Gemma Jones, Imogen Stubbs and Tom Wilkinson fell into place to create a dream ensemble. As a topper, the choice for director was an unlikely but in retrospect pitch-perfect one: Ang Lee (celebrating his 61st birthday today), who had earned praise for his warm and acutely observant films The Wedding Banquet and Eat Drink Man Woman, dealing with family relationship foibles and clashing social conventions, a marvelous fit for the world of Jane Austen. Sense and Sensibility earned box-office success and seven Oscar® nominations, including Best Picture and Supporting Actress (Winslet). The one winner out of the bunch was Thompson for Best Adapted Screenplay, becoming the only person to win both acting and screenplay statuettes. With no undue pride or prejudice, Twilight Time’s hi-def Blu-ray will be a lovely one: two audio commentaries, deleted scenes, five behind-the-scenes featurettes and Patrick Doyle’s lilting score available on an isolated track. Movie lovers with sense and sensibility should herald the disc’s arrival on November 10; preorders start October 28. 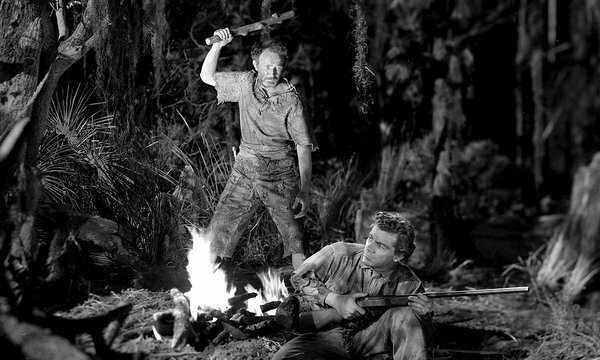 In addition to Ang Lee’s birthday, Twilight Time also commemorates today’s 74th anniversary of the world premiere of Swamp Water (1941), director Jean Renoir’s first American film, in Waycross, Georgia, where it was shot on nearby Okefenokee Swamp locations, a rare undertaking for a Hollywood studio and rarer still for a director new to the Hollywood system. Starring Walter Brennan as a prison escapee seeking to prove his innocence of the murder for which he was convicted, Dana Andrews as the young trapper who warily helps him, plus Walter Huston, Anne Baxter, John Carradine, Ward Bond and Eugene Pallette, Swamp Water is a surprising and suspenseful thriller ripe for rediscovery in the TT tradition of lesser-known films by great directors we’ve showcased on hi-def Blu-ray. The lustrous black-and-white cinematography by J. Peverell Marley and Lucien Ballard is downright magical in this offbeat, rarely seen offering from one of the greatest moviemakers in the medium’s history.